Why you should take our Health & Wellness Challenge & How to Survive! So why Paleo or Zone or Whole 30!? What’s the point, can’t I just workout hard & still eat what I want!? It’s the truth! 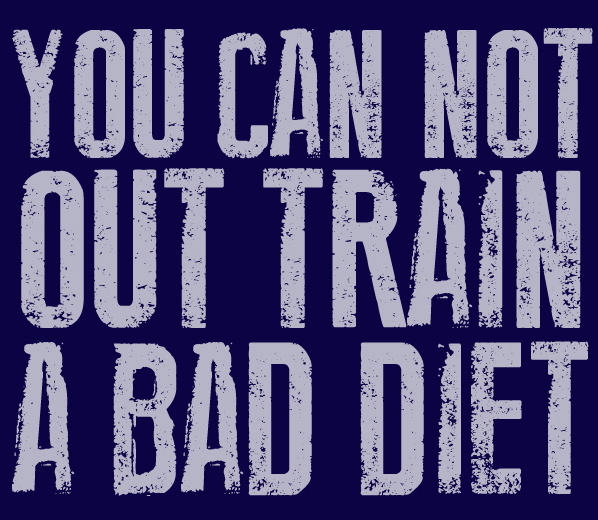 So to answer the above question, sure, you can keep working out as hard as you want, but you simply cannot out train a bad diet. 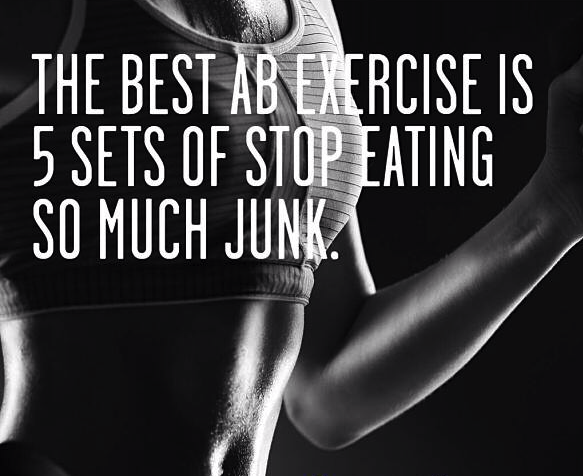 Abs are made in the kitchen & nutrution is key. With spotty nutrition, you’ll most likely hit a plateau at some point, the gains will slow down, and generally you’re selling yourself short on the level of health & wellness you could achieve. The Paleo diet is fashioned after the Paleolithic Era, so you basically eat as the cavemen did! The big idea here is to eliminate processed/packaged foods and to eat real, whole, nourishing foods. The cavemen didn’t have dairy or grains as an option, so these things were not apart of their diet. The Zone Diet is about balancing your macronutrients – protein, fat and carbs – at every meal. This in turns balances out your hormones as well as many other bodily functions while ensuring you’re getting proper nutrition. Most typical CrossFitting men need roughly 15 blocks a day and women need somewhere around 12 blocks, but this can be adjusted based on your goals (like fat loss vs performance). There are several lists (here & here) that outline foods & what serving size equals one block. You’ll notice that the above meals and the lists contain some grains and dairy. While this is an option on Zone, we’re taking these out for our challenge. Again, the goal is to eliminate processed/packaged foods and to eat real, whole, nourishing foods. Sounds familiar huh? 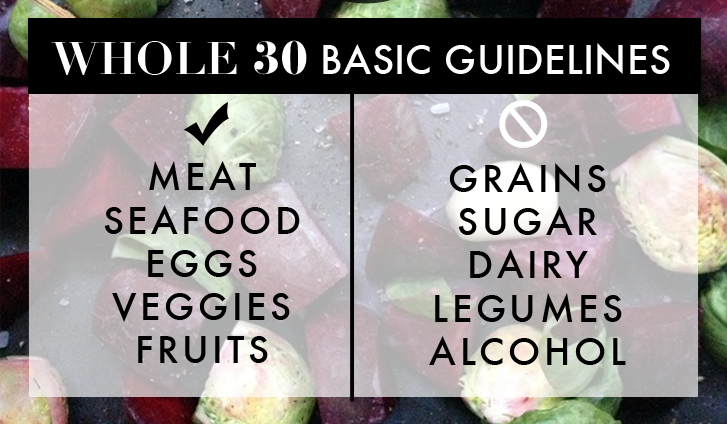 Whole 30 is very similar to Paleo, although a little more strict. No natural sweeteners, like honey or molasses, no recreated Paleo “goodies” and a few other restrictions mentioned here. The point of Whole 30 is to eliminate certain foods groups (sugar, grains, dairy, legumes) that cause inflammation, hormone and gut disruption, and unhealthy psychological responses to see how your body feels without them! Again, the idea is to eliminate processed/packaged foods and to eat real, whole, nourishing foods. Are you noticing a common theme!? I’m convinced that once people know better, they do better. But sadly, most people are plain UNINFORMED about the food they eat. I’d advise you to read around the following pages, whether now or in the near future: Whole 30 Program, Nutrition 101, How to Follow Zone & Paleo, and Paleo Basics. Foods like sugar, grains, dairy & legumes have unwanted side effects that people don’t even realize they’re experiencing – ie aches & pains, digestive issues, skin/dermatological issues, hormonal imbalances, inflammation, allergies, high blood pressure, etc. The foods mentioned above also create a psychological response – we like to reward ourselves with food, satisfy needs/cravings with food, turn to food for comfort, among other things. But the reality is we are not animals doing tricks to earn treats, we are humans fueling our bodies for activities, health & wellness. Celiac Disease and gluten intolerance’s are real and becoming more common due to the fact that most wheat is GMO (Genetically Modified Organism). In fact, Asian countries, like Japan, will no longer import wheat & other crops from the US because they are GMO and infested with pesticides. Other commonly GMO crops in the US include: corn (88%), soy (93%), cottenseed (94%), alfalfa, papaya, canola, and sugar beets. Corn is a grain & is not Paleo or Whole 30 approved! Eggs are not dairy & are Paleo, Zone & Whole 30 approved! Have you learned anything yet!? Are you still reading!?! So now what, how do you survive the 6 weeks of the challenge and beyond? Here are my tips & a little tough love! Plan ahead!!! Go ahead & plan out your meals for the day/week. If you know what you’re going to eat & actually make it, you should have a fool proof plan! If you are stuck hungry with zero approved food available, you’re setting yourself up to fail! Clean out your pantry & fridge! You cannot have cheese & bread staring you in the face every time you open the door. It’s time to purge people! If you’re hungry, eat! Just make sure it’s within the guidelines. This is not meant to starve you, you should be eating!! Read labels, read labels, read labels! If there is added sugar, soy, or other ingredients that sound questionable, they’re out. (As in salsas, marinades, dressings, etc) Just put it back on the shelf & keep looking. Or make your own! The internet is a wealth of knowledge! Do your own research, look up new recipes, try new foods. It will be a trial & error process, learn to love it. This doesn’t have to be expensive!! Know what to buy organic & what to skip. Costco has great deals on organic meats, almond butter, coconut oil, nuts, etc. Earthfare often has their grassfed beef and antibiotic/hormone free chicken on sale, so stock your freezer! Be STRONG! This is not hard. Hero WODs are hard. Cancer, child birth, loss…those things are hard! No cheese for 6 weeks is not hard! Black coffee for 6 weeks is not hard! Mind over matter my friends. You are a grown up & no one can force you to eat that piece of birthday cake or bowl of ice cream! No one says you have to eat steamed brussel sprouts and fish for 42 days straight. Make a commitment to yourself & really do this! Bananas, Apples & Berries – go great with just about any meal. If you’re having a sweet craving, drizzle a little honey on top of some berries! Carrots – provide some good crunch when you need it! Frozen Organic Broccoli – easy & quick to make, sprinkle with some garlic salt, voila! I so hope this helps you over the next 6 weeks and gives you a jumping off point! I definitely do not have all the answers, I don’t know everything about nutrition, and I certainly don’t know all the best recipes out there. If you have questions, just ask! If you need help, just ask! 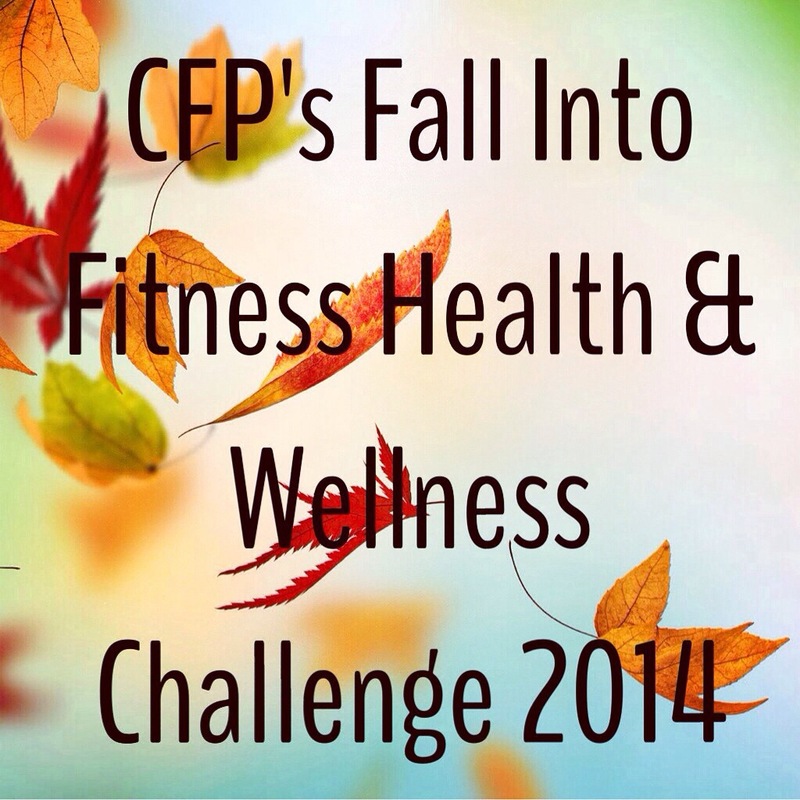 And if you find an awesome recipe, share it on our social media sites with the hashtag #cfpfallintofitness. Share your progress pictures, your inspiration pictures, share it all!! We’re in this together! Our Fall Into Fitness Health & Wellness Challenge starts in just 10 days! In order for you to be as prepared as possible, here again are the food guidelines as well as 3 days worth of sample food logs. Next week, be on the lookout for brief descriptions of Paleo, Whole 30 and Zone guidelines & ways to help you succeed not only in this challenge, but in maintaing good eating habits beyond these 6 weeks! Supplements (protein powders, FitAids, Perfect Bars) are allowed, but should be used in moderation. You should strive to eat real, whole foods and to have some form of protein, carb and fat at each meal, including snacks! If you have a cheat, just write it down & move on. 1 cheat doesn’t equate to failure just like one bad day doesn’t mean you have a bad life!